The idea we will all weigh less and even experience a floating sensation due to a planetary alignment on January 4, 2015 (#zeroday) is entirely false. Sigh. Planetary Alignment January 4, 2015 At 9:47 PST A.M. Will Decrease Gravity For 5 Minutes Causing Partial Weightlessness. Gosh, just when the rumor of 3-6 days of total darkness in December is beginning to die down, another crazy rumor has begun – ahem – floating around the webosphere. Will there be a planetary alignment on January 4, 2015, which will cause a “decrease of gravity,” causing us all to weigh slightly less and even “float?” Of course not. Come on, guys. Get a grip. It has been revealed by the British astronomer Patrick Moore that, on the morning of July 4th 2014, an extraordinary astronomical event will occur. At exactly 9:47 am, the planet Pluto will pass directly behind Jupiter, in relation to the Earth. 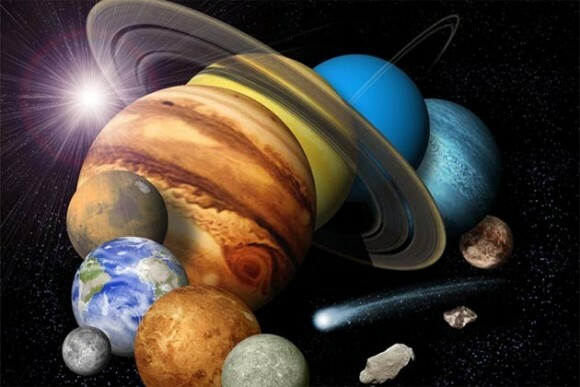 This rare alignment will mean that the combined gravitational force of the two planets would exert a stronger tidal pull, temporarily counteracting the Earth’s own gravity and making people weigh less. Moore calls this the Jovian-Plutonian Gravitational Effect. Moore told scientists that they could experience the phenomenon by jumping in the air at the precise moment the alignment occurred. If they do so, he promised, they would experience a strange floating sensation. Okay, let’s ignore the fact that Sir Patrick Moore died in 2012. So clearly he’s not predicting anything. Let’s just go straight to the reality of the situation. Pluto is not going to pass behind Jupiter. Even if it did, so what? Pluto’s gravity added to Jupiter’s would do precisely zero with respect to our perceived weight and floating ability. And yet in the coming days you will encounter this hoax, for example, here. We at EarthSky first heard this rumor via iflscience a few days before Christmas, 2014. Sigh. Actually, Moore’s hoax had even earlier roots in a rumor that came to be known as The Jupiter Effect, from was a best-selling book by John Gribbin and Stephen Plagemann, published in 1974. It was all the rage among rumor-mongers in the 1970s (of course, there was no Internet then, so rumors didn’t travel with lightning speed as they do today). It predicted that an alignment of the planets on March 10, 1982 would create a catastrophes, including a great earthquake on the San Andreas Fault. This of course did not happen. By the way, January 4, 2015 is the birthday of another famous Brit, Sir Isaac Newton (born January 4, 1643). He is the author of what’s called the Universal Law of Gravitation. That is, Newton realized that the power of gravity (which causes an apple to fall from a tree to the ground) extends far beyond Earth’s surface, as high as the moon, for example. He then put pen to paper and created a mathematical description of how Earth’s gravity would affect the moon’s motion and orbit … thereby laying the groundwork for a lifetime of scientific work that made him one of the most influential scientists of all time. If Newton is looking in on us today from some great pantheon of immortal scientists … he must be very, very sad. By the way, planets do sometimes appear grouped in the sky as seen from Earth. 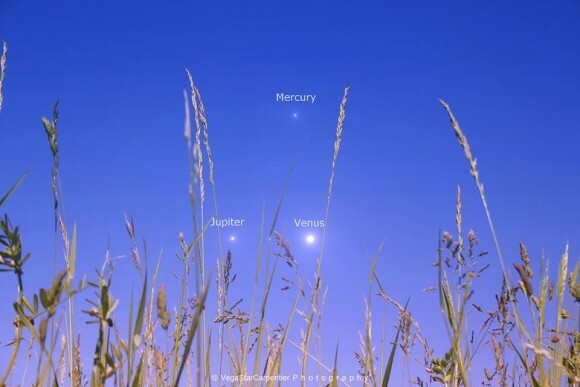 Here are Mercury, Venus and Jupiter seen on May 27, 2013 by our friend VegaStar Carpentier. 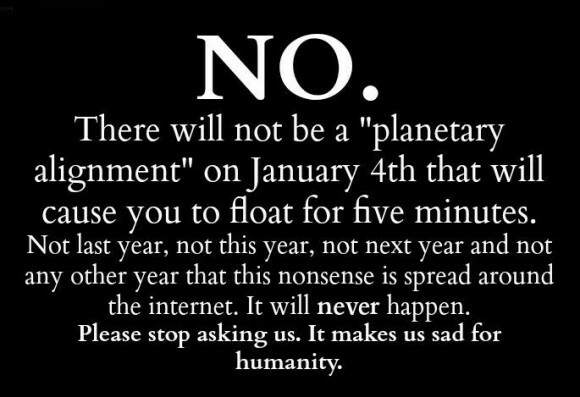 Bottom line: We shouldn’t have to say this, but, since you ask … the idea we will all weigh noticeably less and even “experience a floating sensation” due to a planetary alignment on January 4, 2015 (aka Zeroday) is entirely false. Sigh.